I'll finish blogging about our vacation soon, but real life is busy right now! When we got home from our vacation we came home with a sick baby (who is just now recovering), and what seems to have been a mild bug going through some of the kids. I'm in need of a vacation. :) However we've had busy days and sleepless nights with the baby since we've been home, so I'm going to try to have a couple of down days before I get back to my vacation blogging. On a silly note- Mr. S was heard yelling "Come see! You've got to blog about this! It's so funny!" 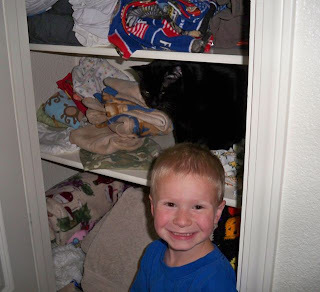 Yep, the cat in the linen closet was the cause of such excitement!